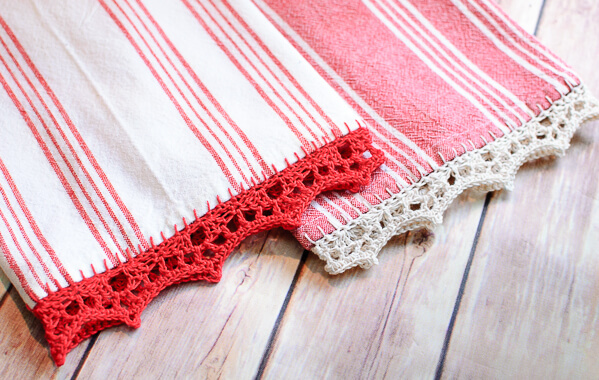 Before beginning, sew a blanket stitch across the edge of your towel using the tutorial here. If you prefer, an alternate option would be to use a sharp crochet hook to edge the blanket as I showed in my Quick and Easy Blanket Edgings post here. Crochet edging is worked in a multiple of 8 + 1. With wrong side of towel facing you, join crochet thread in first blanket stitch on right side. Row 1: Ch 1 (does not count as stitch), sc evenly into blanket stitches along edge for a multiple of 8 + 1 stitches, turn. Row 2: Ch 1 (does not count as stitch), work 1 sc in 1st st, *skip next 2 sts, 3 dc in next st, ch 2, skip next st, 3 dc in next st, skip next 2 sts, 1 sc in next, rep from * across, turn. Row 3: Ch 3 (counts as dc), *ch 1, work 1 dc in 2nd st of 3-dc group, ch 1, [1 dc, ch 2, 1 dc] in ch-2 sp, ch 1, work 1 dc in 2nd st of 3-dc group, ch 1, 1 dc in next sc, rep from * across, turn. Row 4: Ch 1 (does not count as stitch), *work 1 sc in each st and ch-1 sp to next ch-2 sp, [1 sc, ch 3, 1 sc] in ch-2 sp, rep from * across. Block edging if desired… you can find my free tutorial on How to Block Knit and Crochet Items here. For more edging patterns that can be used, see my Quick and Easy Blanket Edgings post here. 8 +1??? Tell me what that means…8 sc plus 1 sc? 9 sc? Never heard this term, thanks! Hi Rose 🙂 This means that the increments of the stitch pattern are in 8s and the 1 is for the last stitch of the row. So if you are sewing a blanket stitch on the edge of a towel, you will want to make sure it is a multiple of 8 + 1, for example 41, 57, 73, etc. Make sense? Love this! I’m using this as a housewarming gift for a friend. 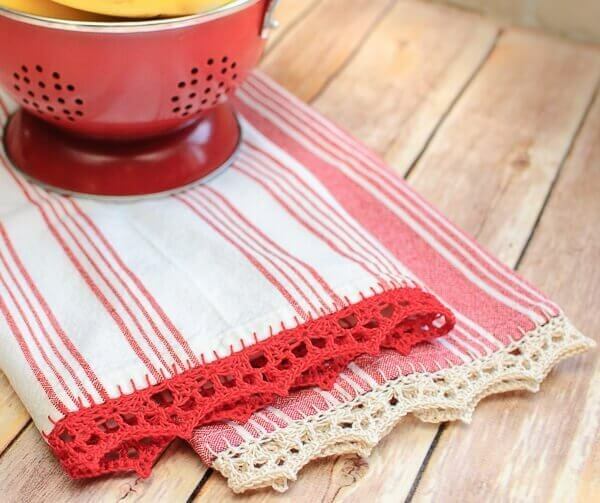 I was wondering…did you put the crochet border on 2 edges of the towel or on just 1 edge? Love the edging. Will have to give it a try. Keep up the good work. Hi Linda 🙂 I used Size 10 crochet thread. Hope that helps! Lovely edge, would make any tea towel look elegant! Love these!! Where did you get those towels? All I can ever find is cheapy terry towels with nasty prints on them!!! These edges would even look great on curtains! Also, with the bright colors, it looks like you’re already for summer! (LOL)! Oooh … What a nice idea! Thanks for this tutorial. I have a question regarding crochet thread sizes. I have seen several patterns where gauge seems to matter, but the instructions don’t specify which size thread to use. At the craft stores, crochet thread comes in a variety of sizes, but on this pattern as well as a few others, the size is not listed. One response was that the thread didn’t have a size. Any suggestions? These towels have the most cheery feeling in the world! I would love to try them. I crochet, but not often with thread. This looks like I might try it. My grandmothers put edging on everything! 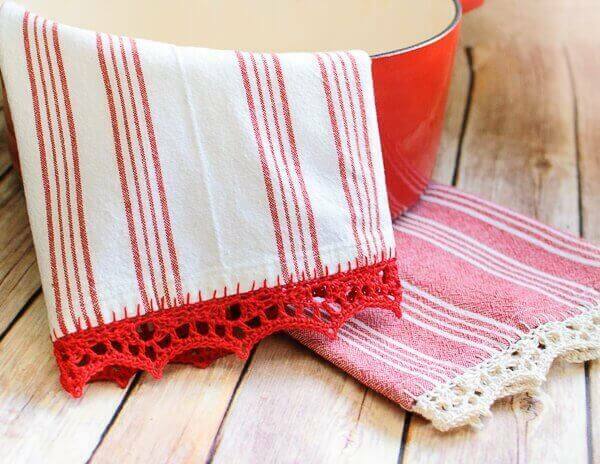 I miss those sweet hand towels, hankies, and cloths for drying dishes. Thanks for sharing! Oh this is so pretty and you make it look very achievable as well. I love your colour choices. This is very pretty, the pattern could also be used to edge a blanket. 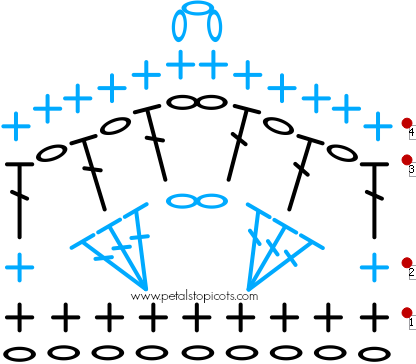 On the blocking, is pinning all you do, or is there more to it? Thanks for all the great ideas and patterns you share. This would also be pretty as an edging on sheets and/or pillow cases. that’s a great border – thank you! another alternative – most basic sewing machines have a blanket stitch and this also can be used. i’ve also had good results using the zig zag stitch if there’s not a blanket stitch option.